The development of harbours, piers and local villages in the southeast has huge tourism potential, particularly with the Tall Ships arriving next year. This was one of the conclusions of a conference held recently in New Ross. Over 200,000 euro has been made available to develop facilities on the Wexford side of the Harbour (Ballyhack, Arthurstown, Fethard-on-Sea and Slade), funding which should enhance tourism in the area. All developments are expected to be completed in advance of the arrival of the Tall Ships and will help to develop and promote the area into the future. Bro. Ben O'Hanlon is well known in music circles around Waterford City, and conducts various choirs in De La Salle College where he teaches music. He is presently composing an arrangement for the Tall Ships event next year. It will be a piece for a chamber orchestra and traditional instruments. Should be worth listening to when it is ready. 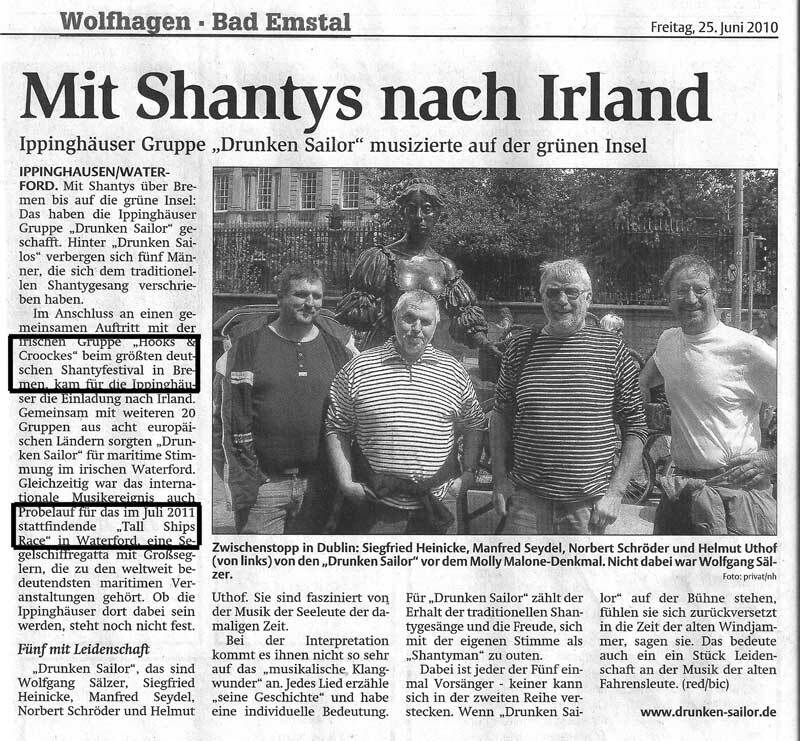 Drunken Sailor are a German Shanty group who performed in Waterford in May 2010 during the recent Seafaring Festival of Music and Song. They came to Waterford via Dublin and while there they made a point of visiting the Molly Malone statue near Trinity College. Their visit to Ireland was reported in a German newspaper, with a photograph of the lads at the bould Molloy Malone. Their visit to Waterford was also outlined in some detail and their association with Hooks and Crookes and where we met them first. Interestingly too, mention was made of the Tall Ships Race in Waterford in 2011, which obviously helps in promoting next years event across Germany. Any volunteers to translate the entire article? 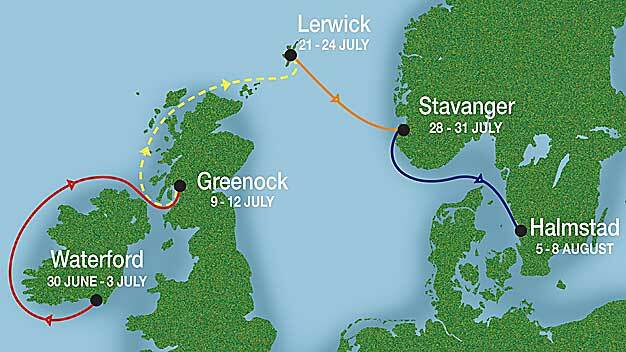 for further details of the three race legs (solid lines on the above map) and the cruise-in-company race (dotted line above). There are some interesting rules specified in the application form. For example: at least 50% of those on board must be aged betwee15-25 years; no person under 15 is allowed on board during a race; and the minimum water line length for all vessels is 9.14 metres. Hooks and Crookes are doing their best to promote the Tall Ships Race in Waterford in 2011. Lester Callanan, Loic Jacob and Cearbhall Turrain are three lucky sail trainees from Waterford who are soon to set off from Kristiansand in Norway to Hartlepool in the UK on a Tall Ship in a Sail Training Programme organised by Sail Training International. The three intrepid sailors are part sponsored by Waterford City Council as part of the lead in to the start of the Tall Ships Race 2011 which the City hosts next year. The Jeanie Johnston: According to yesterdays Irish Times, The Jeanie Johnston will be made seaworthy for the Dublin leg of the Tall Ships stopover in 2012, which, by inference, suggests she will not be seaworthy in time for the Tall Ships Event in Waterford in 2011, and so, like The Dunbrody, may not be in Waterford for this fantastic event in the City next year. Catering & Franchising: Are you interested in Catering & Franchising and maximising the potential therein of the Tall Ships Visit to the City in 2011? Contact Waterford City Council for further details. 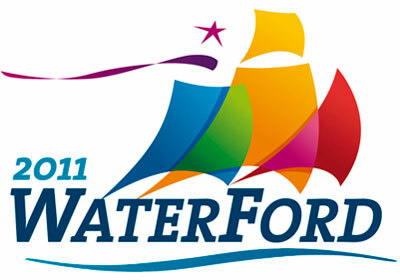 The Waterboys will be one of the Festival acts for the Tall Ships Visit in 2011. See www.waterfordtallshipsrace.ie/press-releases/the-waterboys-announced-for-tall-ships-race-festival for further details. Totem Communications and First Advertising have been awarded the contract to provide advertising and branding services for the Tall Ships Visit in 2011. See www.blog.marketing.ie/?p=3402 for further details. The Mayor Cllr John Halligan is becoming a sail trainee, one of nineteen irish people being sponsored by Waterford City Council in advance of the visit of the Tall Ships coming to Waterford in 2011. See www.sailtraininginternational.org/news/article/read_Mayor-of-Waterford-to-tackle-the-high-seas-in-Tall-Ships-Race_item_100361.htm for further details. Tall Ships Office opens: John O'Shea, the Waterford born Manchester United player, opened the Tall Ships Office in the City (at 41 The Quay, the former Failte Ireland Offices). This office provides a central and accessible office from where the Tall Ships event can be organised and planned by the coordinating committee. See www.sailtraininginternational.org/news/article/read_Man-Utd-and-Republic-of-Ireland-star-opens-Tall-Ships-office-in-Waterford-Patron-packages-to-see-local-businesses-climb-aboard-_item_100297.htm for further details. More Commercial opportunities: The Organising Committee of The Tall Ships Race in Waterford in 2011 is looking for an advertising agency to promote and advance the Tall Ships Event in Waterford in 2011. Submissions by 30th April 2010 to Lar Power, Waterford Corporation, City Hall, Waterford. Contact the Tall Ships Office at 05184960, or email tallshipsrace@waterfordcity.ie for further details. Half a million people are expected to be drawn to the event in Waterford in 2010, which is 150,000 more than what were in Waterford for the Tall Ships Race in 2005. 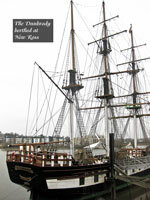 The Dunbrody may not be in Waterford for the Tall Ships Race in 2011. She led the parade of sail for the last Tall Ships Race in the City in 20 05 but she may not leave her berth in New Ross where she is a major tourist attraction. There was a big loss in tourism revenue to the town when she left port for Waterford last time around. A major investment of over 2 milllion euro in the onshore facility at the Dunbrody Visitor Centre in New Ross is expected to be ready by mid-2011 and the town is hoping to attract some of the Tall Ships visiting the region to join the Dunbrody there. see www.newrossstandard.ie/news/dunbrody-may-not-sail-again-x2013-its-not-worth-it-2069718.html for further details. Meanwhile, Afloat, Ireland's Sailing and Motorboating Magazine, while welcoming the Tall Ships Race for Waterford in 2011, and stressing the value of the event to the City, the region and Ireland ("the biggest event in Ireland next year"), is inviting comments on either the immediate replacement of the Asgard, or the chartering of an Irish Sail Training vessel so an Irish vessel can sail up the Suir next year with all the other Tall Ships. 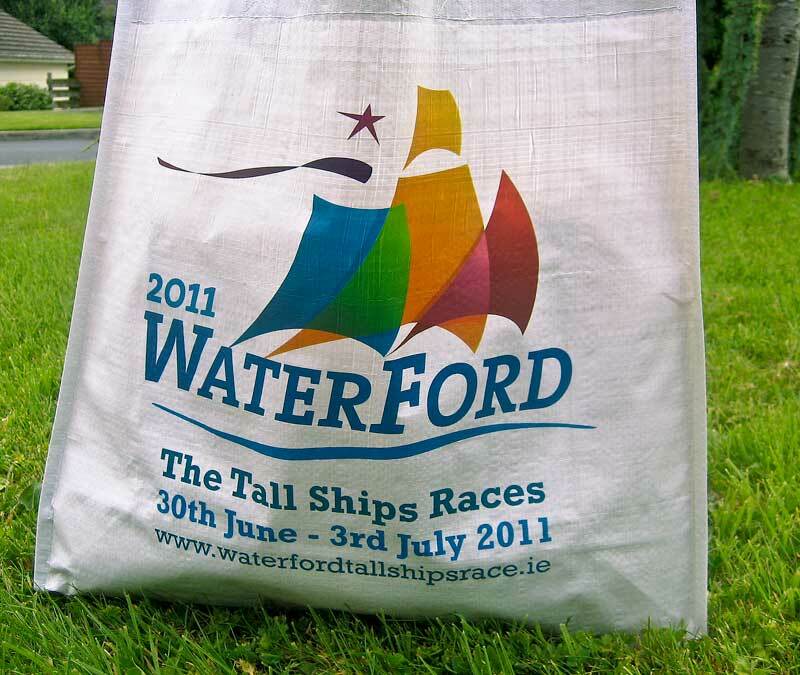 Commercial opportunities: The Organising Committee of The Tall Ships Race in Waterford in 2011 is looking for a reputable company capable of providing a self-contained funfair on the quayside during this important event. For a negotiated fee or royalty the appointed company will have the exclusive rights for hosting the Official Funfare during the event from June 30th to July 2nd 2011. 500 days to go: The official website of The Tall Ships Races 2011 was launched on February 15th 2010 to coincide with the '500 days to go' milestone and the website has a large counter informing how many days are left before this major event begins in Waterford City. It is expected that 70 Tall Ships and their crews will gather for the start of the race in Waterford. The Norwegian vessel, the Christian Radich, star of the 1970s television series 'The Onedin Line' as well as the 1958 film 'Windjammer', is the first tall ship to sign up and many more will follow in the months ahead. At the website launch, the Mayor of Waterford Councillor John Halligan, said hosting the Tall Ships Race will be an important event in Waterford, which, along with the major initiative of Waterford City Council in advancing the new Waterford Crystal Centre on The Mall, will generate great economic benefits for the City and the region. Waterford Port is also delighted to be associated with the Tall Ships Event and Michael Flynn said the Port will commit considerable personnel resources to the marine aspects of the event in association with the harbour master, Capt Darren Doyle, to ensure the safety of the Tall Ships when they are here. Des Whelan, the chairman of The Tall Ships Race 2011 in Waterford, is looking forward to seeing over 500,000 visitors coming to Waterford and the southeast during the four days of the event and he confirmed that a fantastic festival is planned, featuring the very best of Irish music, food and street theatre, the details of which will be outlined on the website in the months ahead. In the Waterford City Council Annual Budget for 2010, the City Manager Michael Walsh, has allocated a sum of €400,000 for festivals of which €300,000 will be set aside for the Tall Ships in 2011. This is line with his stated intention that one of the core provisions of the budget is to support tourism activities for Waterford especially in the area of Arts and Culture, where, despite the economic downturn, he had managed to curtail expenditure cuts in this area by only 5%. The City Manager in conjunction with the City Council are to be commended for their efforts in this regard. Of course this support is recognised by Hooks and Crookes for the City Council's support for our own Waterford Seafaring Festival of Music and Song to be held from the 28th to 30th May 2010. Bance Nolan Ltd, a local Waterford public relations company, along with Dublin-based PR agency, Grayling, has been awarded the contract for the PR campaign for the Tall Ships Race in 2011. Both will be responsible for promoting the event (Bance Nolan in Waterford and the southeast and Grayling nationally and internationally). The Tall Ships race will be the biggest event in Ireland in 2011. Totem wins Tall Ships Branding: Totem Visual Communications, based in Dungarvan, County Waterford, have been awarded the 2011 Waterford Tall Ships Race Festival Branding Campaign.